The funeral for Nicholas Figueroa, inset, will take place at the Church of the Holy Name of Jesus on April 7, reports said. EAST VILLAGE — Family and friends will gather to celebrate the life of Nicholas Figueroa, one of the two men killed in last week’s East Village explosion, in Upper West Side next Tuesday, official said. Figueroa's funeral will take place in the Church of the Holy Name of Jesus, at 207 W. 96th St., on April 7 at 10 a.m. A viewing will be held the day before from 3 to 9 p.m. at R.G. Funeral Homes Inc. at 4425 Broadway, according to his brother, Tyler Figueroa. 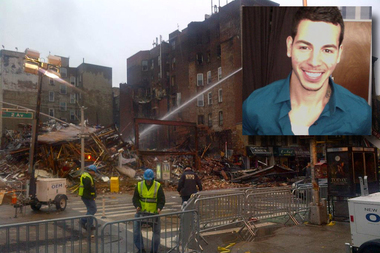 Nicholas Figueroa, a 23-year-old Harlem resident, was on a date at Sushi Park, a restaurant at 121 Second Ave., when the explosion ripped through the building. His body was recovered a few days later in the rubble along with 26-year-old Moises Ismael Locon Yac, who worked at the eatery, officials said. Figueroa’s family and friends described him as a loving young man with a taste for adventure. "He was daring," said his mother, Anna Figueroa, during a vigil on Monday. "He wanted to do everything and experience everything." “Nicholas was a sunshine. He was a loving and caring kid, 23, very active, very involved, wanted to live to the fullest." His family has set up a GoFundMe page to help pay for funeral expenses. As of Thursday afternoon, the fundraiser had already raised $24,700 out of the $30,000 goal.